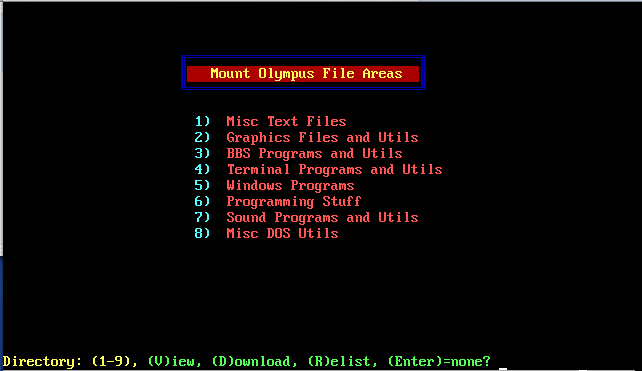 Beginning in mid-1988, I began running a BBS called "Mount Olympus BBS". It used the QuickBBS software, though I had done test setups of it using GTPower, Magpie, Genesis and FIDO. It was hosted on a friends Leading Edge Model D XT-clone out of his townhouse on Bolling Airforce Base in Washington D.C. At the time, I didn't have a hard disk on my Tandy 1000HX, though the basic QuickBBS setup ran happily off of a dual floppy setup. At this time, a handful of other sysops and myself talked about linking our boards in a FIDOnet style message exchange system, using Binkleyterm as the frontend. Over the next few months I made various changes to the software setup and it remained online until a hard disk crash forced it to be taken down in mid-1989. 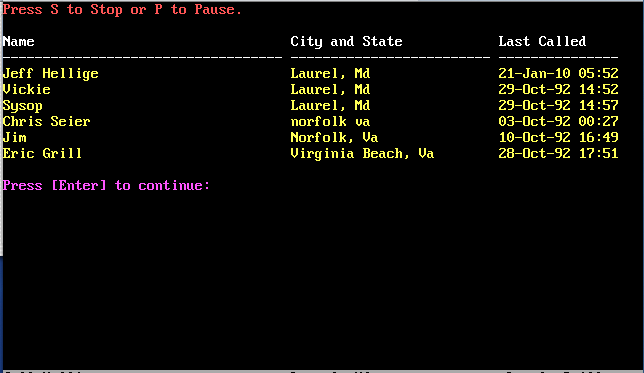 According to Mike Focke's BBS listing of the time, there were nearly 800 BBS systems in the metro D.C. area. Unfortunately, I've yet to find any of my backups of the setup from this time period. The old telephone number was 561-9026. Over the next 3 years I would reconfigure the software, streamlining the menu structure quite a bit and adding a number of doors to the system. 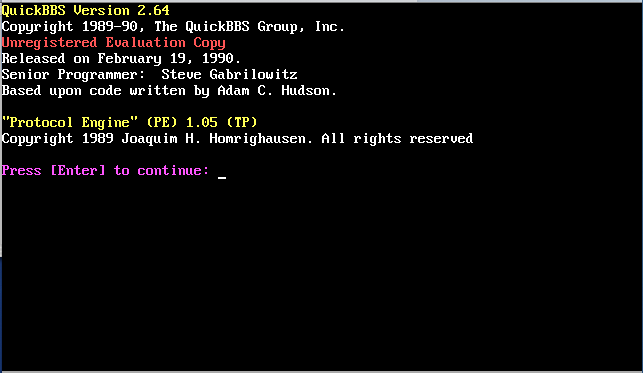 I would also prototype this new system using a newer version of QuickBBS...version 2.64. Other than for testing purposes, this new system would never go online and I would stop working on it in 1992. 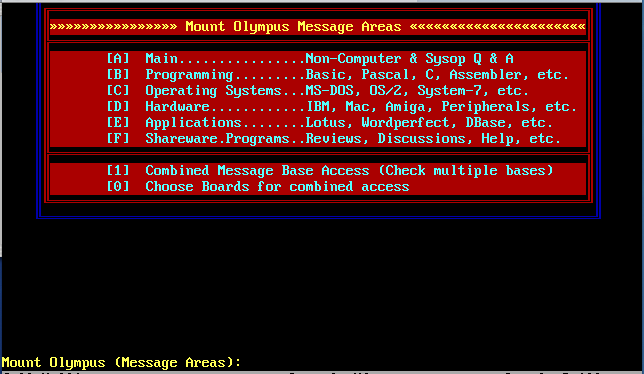 I have found a backup of this system though and was able to get screen captures of the BBS as it would appear online to the user. These images are available below. 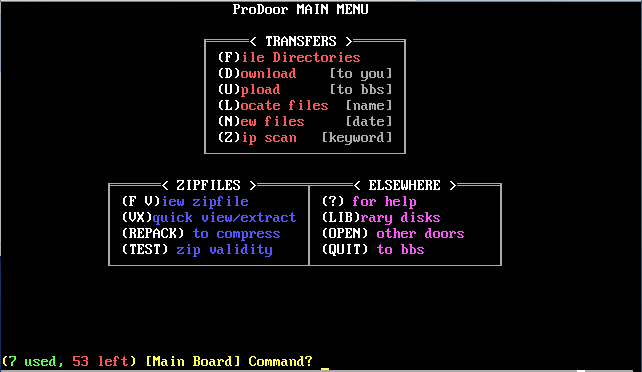 All ANSI menu screens were created with TheDraw, an ANSI drawing program. All of the original setup and testing was done on a dual floppy (internal 3.5" and external 5.25") 1000HX with 640k RAM and a PLUS 1200bps modem. Later testing with the addition of the various doors was done on a Tandy 1000 TL/3. 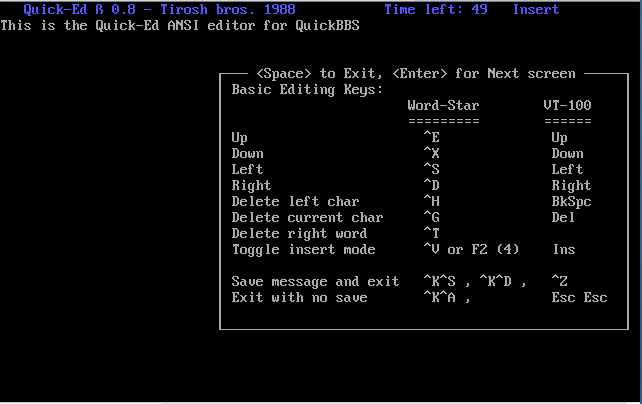 For those unfamiliar with what a BBS is, it provided an online community prior to the explosion of the Internet and Web as we know them today. They provided a means of online discussion and file exchange, even email and multiuser chatting. 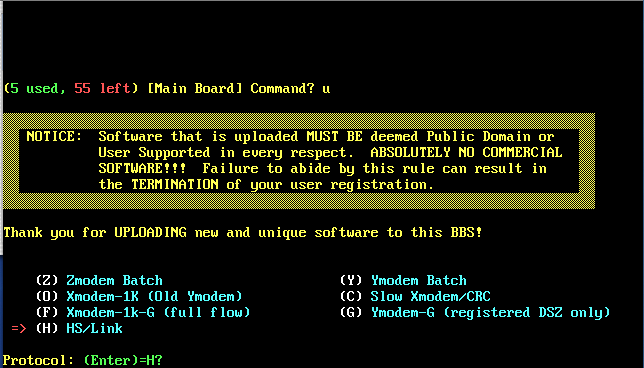 Some BBS software even allowed for multiple connections, called Nodes. 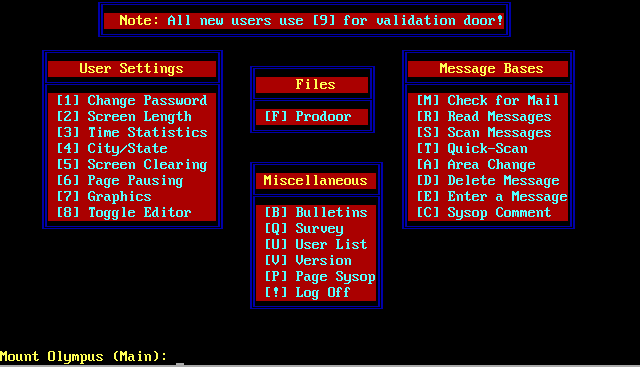 Unlike web pages, a BBS was often run out of the operator's, called the SYSOP, home, using the SYSOP's computer. User's then dialed directly into the BBS over the phone line. 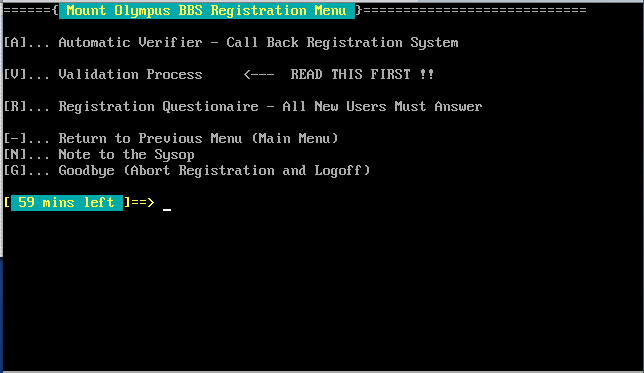 The earliest BBSes appeared in the late 1970's, running on S-100 bus machines using software such as CBBS. In their heyday, the number of BBSes could number in the hundreds for a large metropolitan area, each one having it's own personality. The use of BBSes declined rapidly in the mid-1990's with the explosion of the Internet, though today (2005) they are becoming more popular once again, often being connected to the Internet by Telnet servers. In this way, even very early BBSes, such as the original Searchlight software running on a TRS-80 Model IV, can be accessed. It wasn't uncommon to call any number of BBS's each day to check for new messages and files. Two of my favorite BBS's in the metro-DC area of the late 80's were TandyDC, which was run on a TRS-80 Model 2000 using GTPower and dealt wtih all things TRS-80, and Scorpio Rising, which was run by a mother/daughter team using Opus. 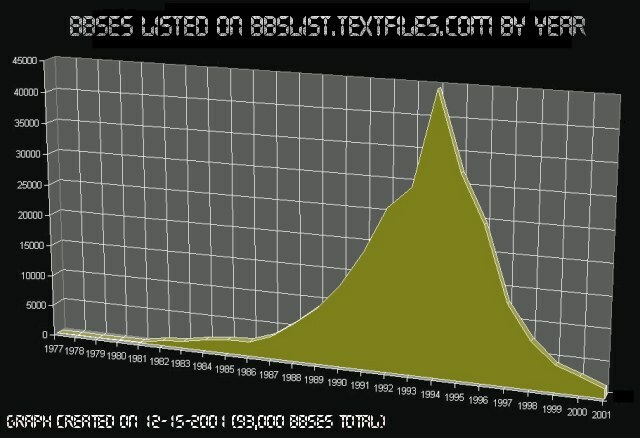 According to a graph created by the author of bbslist.textfiles.com, which contains the data for 93,000 BBS's up until 2001, the number of BBS's peaked in about 1994 with approximately 45,000 systems online. Contrast this with approximately 5,000 to 7,000 systems online in 1988-89 when I was running mine and only approximately 2,000 online in 2001. The number of BBS's online increased steeply from 1986 until 1994 and then decreased sharply with the increased usage of the Internet.